Come Sail Away (to India) | SPACE-BIFF! You know what we take for granted? Nutmeg. We’re eating a bowl of spaghetti, it’s kind of bland, and we just shake a bunch of nutmeg over that sucker like it’s nothing. To the Portuguese explorers of the 15th century, we eat like kings. Better than kings, because those kings could hardly get their royal mitts on any nutmeg at all. See, they were cut off from their lucrative nutmeg trade after the Ottomans conquered Constantinople, and suddenly there’s no nutmeg for anyone. Nutmeg. Nutmeg nutmeg. It’s a nonsense word. Sail to India casts you as a company of Portuguese explorers, shippers, and adventurers, and right away its most impressive feat is transforming this very big idea — trading! building forts! exploiting markets! exploration! technology! — into a surprisingly compact game, only a handful of cubes and 28 oversized cards including references and trackers. It takes the pick-up-resources-and-drop-them-off-for-profit genre and pares away every nonessential bit until it seems laughably thin, then fleshes the concept out again in surprising ways. For instance, there’s an element of worker placement going on with your cubes. Most of the time, these are your ships, moving from Lisbon to India, occasionally stopping to claim a trade good. Seems simple enough. But when you go to sell those goods (and a wider spread of types means greater profits), suddenly you need to worry about the people managing your wealth and victory points back home. Thus you move some of your employed cubes over to act as bankers and historians. 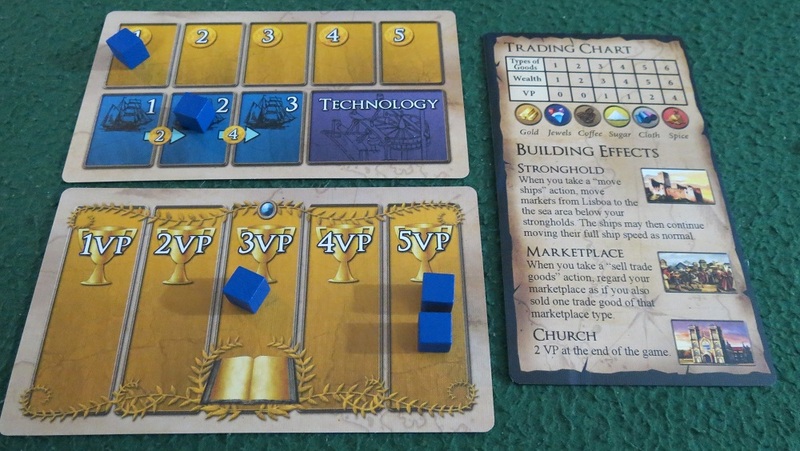 As you expand your empire, eventually colonizing markets for greater trade profits, strongholds to enable easier movement, and churches to generate extra points, now your cubes are pulling triple and sometimes quadruple duty, bouncing between roles as needed. Pulled in a huge profit? Now you need two bankers! Earned more victory points? Employ more historians! It seems appropriate that the more powerful your company grows, your bureaucracy grows apace — and it’s a good sort of growth, since all those bankers and historians represent your hard-earned profits and points while your ships and buildings enable you to continue to profit your way towards India. Employing a bunch of historians really slows down your growth. Method #1: The “Vasco da Gama” — The Explorer. As each new port gives its discoverer a victory point, this player researched maps for a second point per discovery, paid the ship builder’s exorbitant fee to increase their shipping speed, and beelined India, earning points every turn and getting the first pick of newly revealed trade goods. Method #2: The “John III the Grocer King” — The Trader. This player purchased markets and sent out ships in force to capitalize on a wide set of resources for wealth and points, then invested in a banking system to spend that wealth on more points. Method #3: The “Osman Turk Runaround” — The Builder. Focusing on the architecture and Eastern India Inc. technologies, this player moved into new areas and quickly set up strongholds wherever possible, then chuckled at how valuable they were thanks to his technology picks. Method #4: The “My Portuguese History Has Run Out” — The Shipping Magnate. With the harbor maintenance technology, this player was able to capitalize on moving lots of ships for points, and used their profits to usher in the Renaissance. The two most impressive things about this are that (1) everyone was pretty neck-and-neck in terms of points at the end of the game, and (2) this is hardly an exhaustive list of strategies. Nobody tried to build lots of churches, for instance, or use factories to have their trade goods generate more points, or use the printing press to make technologies more valuable. Every group I’ve played with has had the same reaction to Sail to India. It seems too slim at first, perhaps pared down until nothing but the seeds remain, and then it surprises you with how dense its decision space is. As far as I’m concerned, AEG has been doing a great job of providing these excellent filler-esque tiny games lately, including my current favorite deck-building game, Valley of the Kings, and I’m stoked to see how they continue to expand this line. Posted on October 30, 2014, in Board Game and tagged Alderac Entertainment Group, Board Games, Sail to India. Bookmark the permalink. 5 Comments. I’ve got pedants coming out the ears!